Our Basic and Trial accounts do not require the use of credit cards. 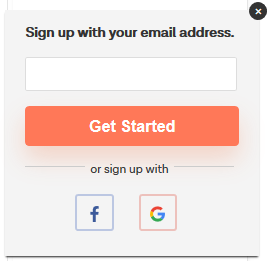 So, you can sign up without any commitment. Credit card information is only requested when you are ready to upgrade. Click on the ‘Sign Up Free’ button in the top right corner. Click on ‘Sign Up Now’ under the Basic package. Upgrade easily from Basic package to a 7-day free Trial of paid packages. Enter your email address or Sign in directly with your Google or Facebook account. Click on Get Started, if you are signing up using an email address. Contact Support to switch back to your Basic package.